Despicable Me - 2010Despicable Me is a 3D computer animation comedy film from Universal Pictures and Illumination Entertainment. It was released in the United States on July 9, 2010 and October 6, 2010 in France. The film starts off by introducing Gru, a super villain who prides himself on being the best super villain there is. But when another unknown super villain makes off with the Great Pyramid of Giza, the world declares every other villain seem second rate. Gru then hatches a plan to take back the top spot as the world's number one villain by following his lifelong dream of shrinking and stealing the earth's moon. With his loyal minions by his side, Grun easily steals a shrink ray gun from the secret base found in Asia. As they prepare to follow through with their plan, a rookie villain named Vector, who's trying to make a name for himself steals the shrink ray gun from Gru, ruining his plan. He attempts to sneak into Vector's well home to get the shrink ray gun back. After failing to steal the shrink ray gun back himself, he sees three girls selling cookies walk into the base with ease. Gru plans to use the girls to steal the shrink ray gun back and carry out his plan to steal the moon. Despicable Me was directed by Chris Renaud and Pierre Coffin, based on an original story by Sergio Pablos who's known for his artwork in major Disney animated films. 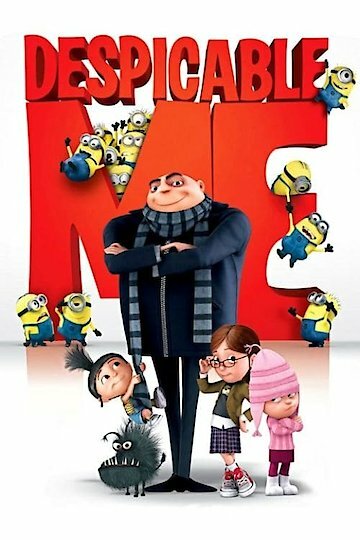 Despicable Me stars Steve Carrel as Gru, the lead super villain, Julie Andrews voices Gru's mother, while Miranda Cosgrove plays the elder of the three sister's. The film's original motion picture soundtrack of the same name was released on July 6, 2010. The album features songs from Despicable Me that are produced, performed and written, performed by Pharrell Williams. Other musical performers in the film are Destinee & Paris, David Bisbal, Robin Thicke, The Bee Gees, and The Sylvers. Despicable Me is the second animated movie released in 3D by Universal Pictures. It's also their first animated feature film produced in 3D. The Golden Globe Awards nominated Despicable Me for Best Animated Feature Film and won Favorite Animated Film in the Kids Choice Awards. Despicable Me is currently available to watch and stream, download, buy on demand at HBO NOW, Amazon, Vudu, Google Play, FandangoNow, iTunes, YouTube VOD online. Video: 'Despicable Me 2' Trailer! Check out the short new trailer for the sequel!